ABOVE: Steingletscher, viewed from the Sustenpass. 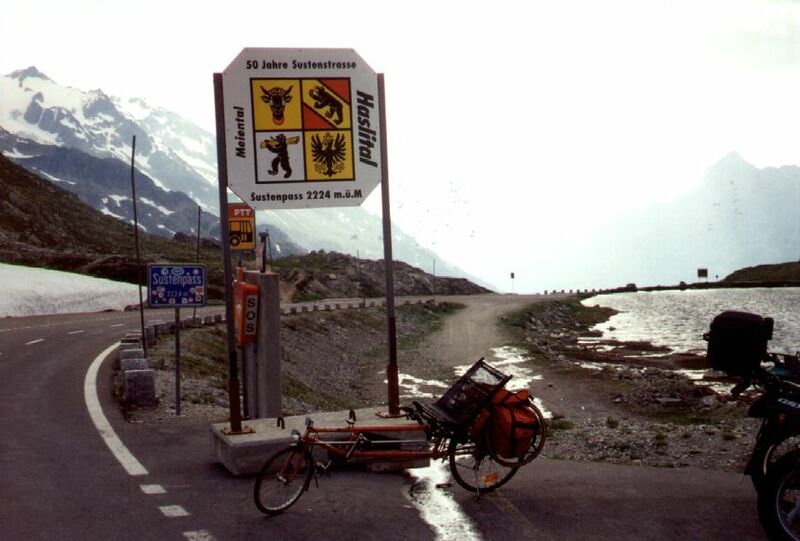 The road to the Sustenpass is one of the Bernese Oberland's most scenic excursion trips. From Innertkirchen, near Meiringen, it twists and turns to an elevation of 7,412 feet (2259m) on its journey of 29 miles (46 km) to Wassen. The latter is just off the main route from Z�rich and Schwyz to Andermatt and the St. Gotthard Tunnel. Along the way, you can stop to view the Steingletscher (see photo) from various points. Allow time for the short hike to the top of the pass, which you can reach from the parking lot near the west end of the summit tunnel that links the cantons of Bern and Uri. 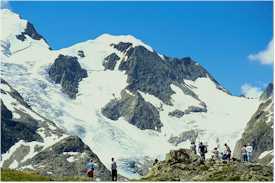 One popular variation is a "three-pass tour," a circular trip of the Susten, Furka, and Grimsel Passes from Meiringen. By car, you can easily traverse all three passes in a day, returning to Meiringen in time for supper. The Susten road is open from mid-June until late September. Driving is easy enough if you don't mind hairpin curves and grades of up to 9%. Bicycling is another option if you're physically fit, but you'll need a bike with plenty of gears and reliable brakes. As a non-motorist, I recommend Swiss Postal Bus route 370.70, which is operated by Postauto Berner Oberland. Buses run from the third weekend in June until the third weekend in September. Travel time from Meiringen to the summit of the pass is 1 hour 8 minutes. One bus a day (the 2:10 p.m. departure) continues to G�schenen, arriving at 3:50 p.m. From there, you can catch the 4:06 p.m. train to Z�rich or the 4:10 p.m. train to Lucerne. The 9:10 am, 11:00 am, and 2:10 pm buses normally carry bicycle racks; the Swiss Official Timetable has details. 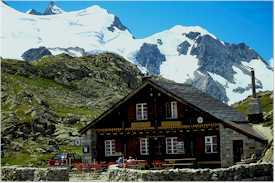 Postauto Berner Oberland also offers a "Glacier and Passes Panorama Tour" that includes the Susten, Furka, and Grimsel Passes. The special "comfort buses" have large windows for scenic views. For timetables and prices, call 033 828 88 28 or fax 033 828 88 29 within Switzerland. It's a good idea to make bus reservations, especially if you're taking a bike. You can do this at the Postal Bus ticket windows in most Swiss Post Offices. Or contact Postauto Berner Oberland at the numbers above. The town of Meiringen is a good starting point for a tour of the Susten, Furka, and Grimsel passes. Local attractions include the Aare Gorge, Upper Reichenbach Falls, and Sherlock Holmes Museum. Everything you need to know if your motto is "Skip the bus and leave the driving to us." See the riderless low-profile bike in Anton Ertl's roadside photo from Do recumbent bicycles go mountains?